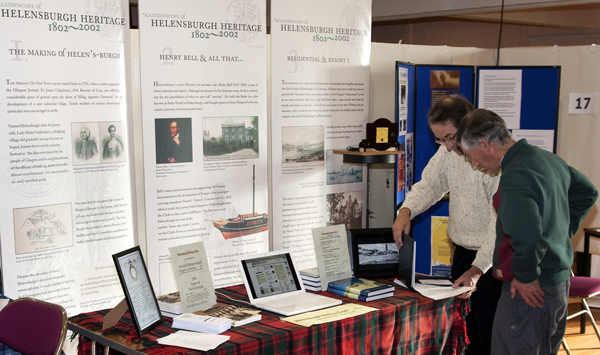 The exhibition was staged by Helensburgh Rotary Club and followed similar exhibitions in 1970, 1980, 1990 and 2000, all with the aim of demonstrating to local residents, old and new, the huge variety of activities available in the area. Entry was free, and there were special events at the hall throughout the four days, including presentations by the Scouts, Fire Brigade, and the Margaret Rose School of Dancing, and musical entertainment by a string quartet and a trio. Coffees, teas and light refreshments were available. The official opening was performed on the Wednesday evening (October 6) by Councillor Vivien Dance, who was introduced by Helensburgh Rotary Club president Dave Campbell. Trust directors Nigel Allan and Alistair McIntyre are pictured at the Trust stall. Photo by Donald Fullarton.